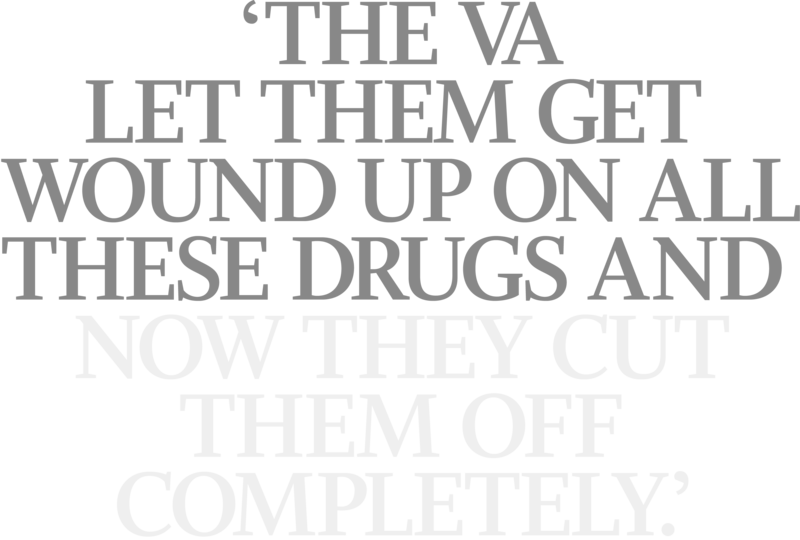 VA doctors freely handed out pain medications to veterans for years. Then they stopped. The results have sometimes turned tragic. WORST-CASE: Iraq veterans Zach Williams and Ryan Trunzo overdosed after battling chronic pain and withdrawls from pain medication. Zach Williams came home to Minnesota with two Purple Hearts for his military service in Iraq. He also carried other lasting war wounds. Back pain made it hard for him to stand. A brain injury from the explosions he endured made his moods erratic. Williams eased the chronic pain with the help of narcotics prescribed for years by the Minneapolis Veterans Medical Center. Then the VA made a stark and sudden shift: Instead of doling out pills to thousands of veterans like him — a policy facing mounting criticism — they began cutting dosages or canceling prescriptions, and, instead, began referring many vets to alternative therapies such as acupuncture and yoga. At first, the change seemed to work: Worrisome signs of prescription drug addiction among a generation of vets appeared to ebb. But the well-intentioned change in prescription policy has come with a heavy cost. Vets cut off from their meds say they feel abandoned, left to endure crippling pain on their own, or to seek other sources of relief. On Sept. 20, 2013, police were called to Williams’ Apple Valley home, donated to him by a veterans group grateful for his sacrifice. Williams, 35, lay dead in an upstairs bedroom. He had overdosed on a cocktail of pills obtained from a variety of doctors. Authorities ruled his death an accident, officially “mixed drug toxicity.” Advocates for veterans and some treatment counselors angrily call it something else: the tragic result of the VA’s failure to provide support and services for vets in the wake of the national move away from prescription pain pills. At the VA’s Medical Center in Minneapolis, for instance, there is one chiropractor on staff for the more than 90,000 patients it sees a year. “The VA has been doing an awful job on this issue,” said Dr. Andrew Kolodny, chief medical officer for Phoenix House, a drug and alcohol rehabilitation organization that runs more than 130 treatment programs in nine states, including programs for veterans. Before alternative therapies can work, Kolodny said, the VA needs to better tend to the addicts it has created. Video (2:05): Neva Howard talks about how pain changed her fiancé, Zach Williams. VA leaders strongly defend the work they’ve done to wean thousands of vets off highly addictive pain pills and to direct them toward other ways to treat their chronic pain. “VA has been at the forefront in dealing with pain management, and we will continue to do so to better serve the needs of veterans,” Carolyn Clancy, the interim VA undersecretary for health, told the Senate Veterans’ Affairs Committee earlier this year. In May, four members of Congress asked the U.S. Government Accountability Office why vets are having trouble accessing alternative treatments and why some vets are no longer getting the medications they need. Almost 60 percent of veterans returning from the last decade of war list chronic pain as their most common medical problem. The VA’s initial solution: a powerful but potentially addictive class of drugs known as opioids. During an 11-year period ending in 2013, the number of prescriptions from the VA for pain meds like oxycodone and morphine surged 259 percent nationally. At VA hospitals in Minneapolis, St. Cloud, and Fargo, prescriptions for morphine and oxycodone more than doubled for every 100 patients from 2001 to 2014. Methadone prescriptions almost tripled, according to data obtained by the Star Tribune through the federal Freedom of Information Act. Lawmakers and some veterans groups, concerned about overdoses, drug suicides and reports that medications were being sold on the street, pushed the VA to adopt more effective pain management protocols. A 2012 DEA rule change led to a steep decline in prescriptions for addictive painkillers at VA hospitals and clinics, while the number of veterans seeking treatment for chronic pain has steadily increased since the start of the wars in Afghanistan and Iraq. The charts below show pain prescription data for the three regional VA hospitals in Minneapolis, St. Cloud and Fargo since 2001. In 2009, the VA instituted new regulations that required clinicians to treat the root causes of pain, rather than just dispense more painkillers. In the midst of the changes, another federal agency - the Drug Enforcement Administration – in 2012 imposed new rules on the pain prescriptions the VA is still providing. The Minneapolis VA, which had one of the highest rates of high-dosage prescription pain medications, has embraced the new directive to reduce painkiller use among its patients. It pioneered a program that emphasized education and alternative therapies like yoga, chiropractic treatment and acupuncture. In a three-year period from 2011 to 2014, it reduced the number of veterans on long-term high-dose opioids by 78 percent. National VA leaders trumpeted Minneapolis’ success. “I would be the last person to say we are now right where we want to be with our pain care in VA, but I will be the first person to say that we are well along in the process of getting there,” Dr. Robert Petzel, then the VA’s undersecretary for health, told Congress last year, using the Minneapolis program as an example. In Minneapolis, Dr. Peter Marshall, head of the Minneapolis VA’s pain management staff, launched the Opioid Safety Initiative in 2011. In letters to primary care doctors, he and his team offered to help wean their high-dosage patients from their reliance on the most highly addictive painkillers. By October 2014, the number of high-dosage prescriptions at the Minneapolis VA was down 90 percent. Video (2:04): Dr. Peter Marshall explains the goals of the VA’s pain management strategy. In their published findings, Marshall and his colleagues wrote that there were fewer complaints than expected. “Patients mostly appreciated what we were doing,” said Marshall, who now directs pain management programs at the Minneapolis VA and the VA’s Upper Midwest region. While the paper recommended further research into patient satisfaction, the study surveyed only providers and pharmacists. Although statistics aren’t available, deaths of vets linked to the VA’s pain policy are showing up in headlines around the country. Last July, Navy veteran Kevin Keller drove himself to a drugstore parking lot next to a VA community clinic in Wytheville, Va., late at night, walked to the door of the clinic and shot himself in the head. In October 2013, Todd Roy, a 45-year-old Persian Gulf veteran, shot himself in the head with a shotgun in friend Charlie Bollman’s garage in Watkins, Minn. In 2008, the VA, citing alcohol and drug abuse, had cut off Roy’s Vicodin for pain in his arm and shoulder. “If someone is taking narcotics and you cut him off cold turkey, there’s nothing good that’s going to come from that,” Bollman said. Living with the VA’s new painkiller policy has been a tough adjustment for recent and older vets alike. Army vet Dan Klutenkamper said he went to the VA in 2012 to seek help for chronic pain for a degenerative disc brought on by two tours in Iraq and one in Afghanistan. “They told me they weren’t giving anything out right now because of the mismanagement of the medications that they had done,” he said. After several attempts, Klutenkamper said he gave up and began abusing alcohol. He’s sober now. Except for a prescription for anti-depressants, Klutenkamper says he avoids the VA.
For more than 40 years, Vietnam vet Peter Ingravallo has suffered back pain after being hit with shrapnel during an ambush. With a 100 percent disability rating, Ingravallo took 25 milligrams of oxycodone every four hours until the Minneapolis VA sent him a letter telling him it was reducing his medications by 70 percent. It also warned that he would lose his benefits if he got meds from somewhere else. There was no dosage tapering and no offer of alternatives, he said. A LONG WAIT: After two tours in Iraq and one in Afghanistan, Army veteran Dan Klutenkamper (right) went to the VA to seek help for chronic pain. It took him a year to get his first appointment on his disability claim and 7 months to find out if it was service related. CONSTANT PAIN: Vietnam vet Peter Ingravallo took 25 mg of oxycodone every four hours until his medication was cut by 70 percent. The Minneapolis VA’s chronic pain unit offers a weekly, hourlong “Pain Options Class” and has developed a landmark four-week inpatient treatment program. But at times the VA also sends a harsher message. Some veterans, many who had no history of addiction, got letters announcing they were being taken off their pain medications without offers of assistance or explanation. “There wasn’t a lot of discussion with the veteran except for the provider saying, ‘We’re not going to be doing this anymore because it’s not good for you,’ ” said Joy Ilem, of Disabled American Veterans, one of the country’s largest veteran service groups. Some vets have been warned that if they don’t take part in educational programs, they won’t get prescriptions. Failure to submit urine samples could result in expulsion from the program. Vets also complain of being kicked out of programs for failing “pain contracts” they were ordered to sign. The contracts require the vets to agree to submit to urine screenings and to take one of several VA opioid safety classes or risk being denied their medications. “Are you kicking people off opioids then or are you trying to do the right thing?” asked Marshall, the Minneapolis VA’s head of pain management. The VA appears to have sent mixed messages about the contracts, including whether they even exist. Asked about the discrepancy, the VA said its policies changed five days after the letter to Franken’s office was sent. FATHERLESS: Zach Williams' fiancée, Neva Howard, with their baby girl, Katerina. Zach Williams’ fiancée, Neva Howard, said he had initially embraced nearly every program the VA had to offer, taking classes to deal with PTSD and working closely with his doctor on his pain. But one day when a nurse gave him his meds, there were fewer than there should have been. There were even fewer as time went on. Howard said a nurse told him that a decision had been made to wean him from the medications. The Minneapolis VA, which treated Williams, did not comment on his case, citing privacy laws. Williams started seeing a private physician, and Howard said there appeared to be progress. But there were still days he couldn’t get out of bed. His diet consisted mostly of pizza and energy drinks. He treated the injuries to his body and mind with prescriptions from several doctors. When he died, police found an assortment of drugs around the house: a sealed container of the stimulant Adderall, sealed prescriptions of the panic disorder drug Clonazepam and the painkiller oxycodone. On the kitchen table were two packages of the painkiller Fentanyl. A combination of Fentanyl and the panic disorder drug Venlafaxine had proved fatal. In June, VA officials were called to Capitol Hill to address concerns that their aggressive pain management policies were going too far. Sen. Tammy Baldwin, D-Wis., introduced a bill requiring stronger guidelines for prescribing opioids. It would also require the VA to develop plans for researching and using alternative pain therapies. “We have a long way to go to figure out what works best,” she said. Ryan Trunzo’s descent from promising soldier to drug addict is detailed in more than 500 pages of medical files and Army reports. His family in Andover shared them in hopes that his story would illustrate the effect of the VA’s policies. Trunzo, who was 19 when he joined the Army, served in Iraq from February to November 2008 and was injured when his convoy was hit by a roadside bomb. He suffered several small fractures in his back and was given some painkillers. There were other traumas: the death of a close friend, the shooting death of an Iraqi boy and an incident in which he said he was ordered to stand guard while a superior officer sexually assaulted an Iraqi woman. Back home in Andover, the St. Cloud VA prescribed drugs — 13 pages’ worth over time. But, because of a history of addiction during his military service and the change in VA policy, for the pain Trunzo got tablets of nothing stronger than over-the-counter-strength ibuprofen. MISSING SON: Paula Trunzo in her son Ryan's bedroom, which remains as it was before he died. Ryan Trunzo was injured in Iraq and received pain medication at the St. Cloud VA. But with the change in VA policy, he received only ibuprofen, and eventually started using street drugs. His family found him, a syringe in each arm and one in his chest, when they returned to their Andover home on Father’s Day weekend last year. A week later, on Father’s Day weekend, the family packed up for the cabin near Lake Vermilion. Ryan didn’t go. Driving back, Paula suspected something was wrong. She rushed into their home. Ryan lay dead on his bed, a syringe in each arm and one in his chest. The cause of death was heroin toxicity. He was 26. His mother thinks he meant to take his own life. “The pain was too great,” she said. Paula Trunzo has a one-word answer when asked now how she feels about the VA.
Staff writer Glenn Howatt contributed to the data analysis of this story. Veterans face strapped system as VA shifts to alternative therapies.